Whilst we highly recommend using the Steam version of Besiege in order to play Multiplayer, because it does all the work for you and is potentially more stable, you can also play without it! If you use the Steam version of Besiege you will need to close Steam before launching the game in order to play with people who aren't using the Steam version (Humble, Gog, etc). Hosting a multiplayer session without Steam may require you to open port 7777 on your router, otherwise players may have trouble connecting to you. Unfortunately playing without Steam also means it is unlikely you'll be able to connect to players who live a long distance away from you (For example Russia to USA or Europe to Asia). Due to latency issues we've created regional master servers which allow you to connect with other players. 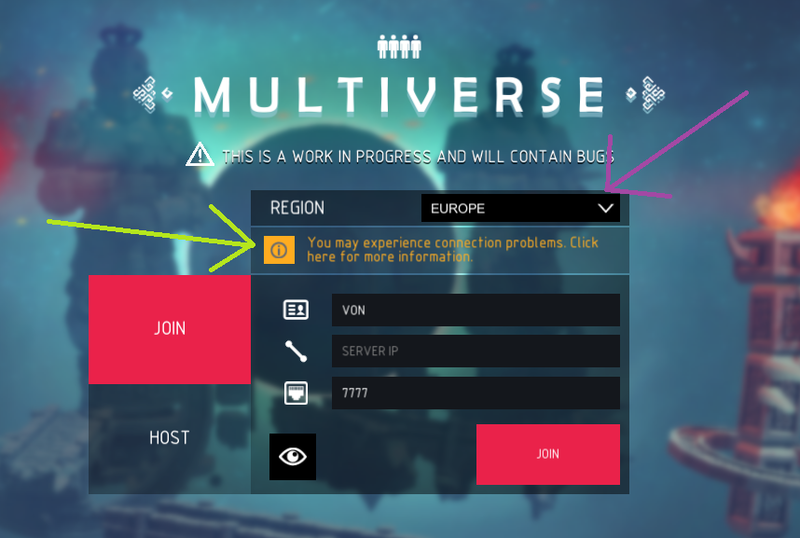 You will need to select the region that is appropriate to you before attempting to host or join a multiplayer session. The purple arrow shows you where you can change the region you're using and the green arrow is pointing to where your connection status is displayed. Clicking the orange icon will open a panel giving you more information about your current connection status.